Bracknell ARC was on air on Monday 24th June 2013 as part of the RSGB Centenary celebrations while it toured Region 9. We operated from the scout hut in Freeborn Way throughout the day on the HF and VHF bands. See g4bra.org.uk/g100rsgb.htm for a summary of what we did on what was a quite successful day. Bracknell ARC reserved the special anniversary callsign G100RSGB for use on Monday June 24th 2013. Gx100RSGB is the special call being used during 2013, the RSGB‘s 100th anniversary. During the year it is touring all 13 of the RSGB regions and is active from Region 9, London and Thames Valley, during June and July. This page details the background to G100RSGB and the club’s activation of it. Based on “Fifty Years for the advancement of amateur radio”, RSGB Bulletin July 1963, p17-28 from an earlier document by the late Pat Hawker G3VA. Published at the time of the Golden Jubilee. In the early days of amateur radio, clubs began to be formed around the UK and elsewhere. The Derby club was one of the first, in 1910. The first national society was The Wireless Institute of Australia which formed in 1910. But there was no national society in the UK, ARRL did not form till 1914. Rene Klein, at that time using the call KXJ, wrote to the press deploring that there was no association in London for wireless experimenters. As a result 5 prospective members met at Klein’s home in West Hampstead on Saturday July 5th 1913 for a preliminary meeting. They decided to form the London Wireless Club having its object “the bringing together of all amateurs interested in wireless telegraphy and telephony”. So the beginnings of our society, the date which we are celebrating this year. Shortly afterwards the GPO announced that it would introduce a charge of one guinea for all transmitting and receiving licences. Rene Klein and another member, F Hope-Jones, approached the GPO to discuss this, the start of a liaison with the licensing authorities that has continued to this day. At its first General Meeting on September 13th 1913 it was decided to change the name to the “Wireless Society of London” to reflect the change from a local club to a national society. A.A.Campbell-Swinton, a famous scientist known for his work in cathode ray tubes, was appointed the first President of the society and offices in Victoria Street were obtained, where RSGB was for many years. Members grew, but then World War 1 intervened. All transmitting and receiving amateur activity was prohibited, even antennas had to be dismantled. It was not until late 1919 when licences were again issued although initially for receiving only with transmitting licences not being issued until late 1920. The society continued to grow, not without some difficulties on the way, various transatlantic test took place, and in 1922 it changed its name to the Radio Society of Great Britain. In 1925 the first edition of the T and R Bulletin, later becoming The Bulletin, and now RadCom, was published. The society we have today had arrived. To celebrate its centenary various events are being organised throughout the year. Details of these, which will be updated during the year, can be found on the RSGB website. Gx100RSGB is one of those events and is an opportunity for clubs all around the UK to participate in the celebrations. Linked to the station is the RSGB Centenary Award where points are awarded for working the station in each of the 13 regions together with points for other QSOs within the UK and Commonwealth. For full details of this award, how to score and how to enter can be found here. G100RSGB will be much in demand from those chasing the award and were kept busy on our activity day. It will be interesting to see how this year’s celebrations compare with the Golden Jubilee in 1963. 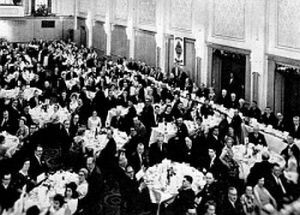 That year there was a full week of celebrations which included visits to the BBC Television Centre, Mullard and the London Planetarium culminating on the July 5th anniversary with a Jubilee Dinner held in the Connaught Rooms in London attended by more than 400 members. This year there will be a day of celebration at Bletchley Park and a dinner at Horwood House in Buckinghamshire on July 5th followed by a BBQ-on-the-air on the Saturday.Browsing the Bulletins of 1963 makes interesting reading – Jack Hum G5UM said in his review ‘The feeling is strong, too, that few of us are likely to see the next Golden Jubilee of the RSGB so let’s make the most of this one.’ Indeed Jack and many of the other calls which appear in that issue are now silent keys, but I am sure there will be some still around from then. Bracknell ARC ran G100RSGB from the 2nd Bracknell Scouts Scout Hut in Freeborne Way, Bracknell. 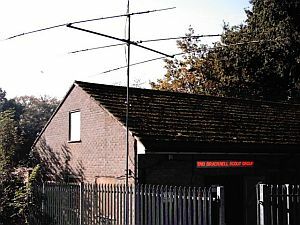 The photo shows it as it was when it was used as GB4SBS in Jamboree on the Air in 2005. 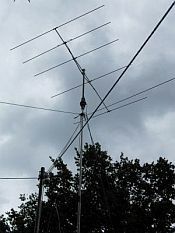 In 2008 the club installed a 10m telescopic mast, Jaybeam triband beam, a Tonna 9 element yagi for 2m and a doublet which was first used in JOTA in 2009 and has been regular used for the monthly 2m UKAC contests as G6BRA. Additional antennas were erected for the event and we were active on all HF bands, 6m and 2m with operation on SSB and CW. We were active for the whole 24 hours and used the RSGB Alert system together with being spotted often on the packet cluster network. On the Saturday we set up most of the antennas and on the Sunday the equipment itself. The plan was to begin operation at 0000z on the Monday and operate through the complete 24 hours. It was not known in current conditions whether the night shift would be fruitful, in the event a reasonable amount of DX was available in the first couple of hours but then it slowed down. 40m was found to be the best band in the later part of the night, but the effects of a geomagnetic storm a few days before made it hard going until later on in the day. It was soon realised that running two high power stations with the antennas so closely spaced was a bad idea and there was much interstation interference depending on the choice of bands. So for much of the time only one of the HF stations could be used. We also found that our triband beam had gone u/s and the tower had to be lowered to investigate – this was traced to a bad PL259 connector and cured, though it delayed our activities somewhat. We did however find that we could have quite a few QSOs on 20m with the doublets and with conditions as they were there was not that much DX about anyway, mainly European stations. The 6m station worked well, but again there was not much in the way of propagation and sporadic E was totally absent. So it was not until the evening when we were able to work much on that band. Likewise 2m, though realistically we had not expected much on there on a weekday daytime. Although DX in general was absent we were very pleased in the evening to QSO Mike VP8NO on the Falkland Islands. Mike is a keen chaser of the RSGB Centenary Award and needed us for Region 9. We were happy to follow Mike through the bands and work him on 20m SSB, 17m SSB and CW and 15m CW, by far our best DX of the day. RF problems reared their head again later in the evening with the laptop on the FTDX5000 station locking up. A different laptop was brought in for that station and used for the final couple of hours. Logging on all four stations was with the N1MM software in its DX mode and worked well despite some our ops not being familiar with it. Logs were submitted to RSGB on the Tuesday afternoon and available on the ‘am I in the log’ page shortly afterwards. Below are the results of the day, with which we are pleased. Would we do it again, sure….More photos can be found in our photo album.